I am staying in Bologna for a few days this week, celebrating some important family milestones. 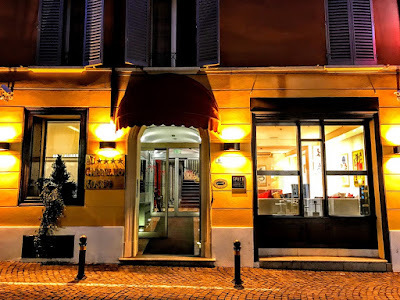 I arrived here in the early afternoon on a Ryanair flight from Dublin, and I am staying until Saturday morning at the Al Cappello Rosso Hotel. I have been in Italy about ten or a dozen times in the past, and this is my second time this year, having spent a week in Rome in January. The hotel is in the central but secluded Via Fusari and boasts an interesting history. The first documents trace this hotel back to 1375, and it welcomed the first ‘foreigners’ passing through the city in the 14th century. When the tavern was being built, the small houses in Via de’ Fusari were pulled down. It is said that when building work began on Bologna’s famous Basilica of Saint Petronio in the 14th century, Cardinal Albornoz assigned the hotel the unusual sign of a cardinal’s hat – cappello means ‘hat.’ The sign was meant to mark the lodging reserved for the architects and artists building the basilica. The church was left uncompleted in the 15th century in order not to exceed the size of Saint Peter’s in Rome. According to tradition, Pope Pius IV halted the majestic project. However, it is still the tenth largest church in the world, he largest church built of bricks. Later, the tavern was owned by the Cardinal Nicolò Albergati (1373-1443), Bishop of Bologna from 1417, to ensure his protection to the Jews passing through Bologna. They were allowed to stay in the town for only three days at a time and only at the Capel Rosso, as at the time it stood outside the city walls, then in the Piazza Maggiore. Until the mid-15th century, the so-called Ufficio delle Bollette, an office charged with keeping an eye on foreigners, innkeepers and prostitutes, was just a few steps from the hotel. In 1464, the hotel was bought by Andrea Barbozza, a professor of law at the University of Bologna. An aristocrat from Palermo, he moved to Bologna and established a family dynasty that attained senatorial rank. He bought the hotel for 1,706 picchioni or pegioni, large silver coins minted by the Dukes of Milan. In the deed by notary Giacomo Mangini, the building is described as a house occupied by the tavern ‘of the hat’ and three shops. Two of these shops were destroyed by a fire in 1497 that also damaged the adjoining apothecary’s shop or spezieria del Dottore. Better known as spezieria del Mondino, it was one of the first opened in Bologna and belonged to the family of the renowned doctor, Mondino de’ Liuzzi, one of the fathers of anatomy. In 1467, Andrea Barbazza let the hotel to an innkeeper name Bertuccini at an annual rent of 110 Bolognese lire. 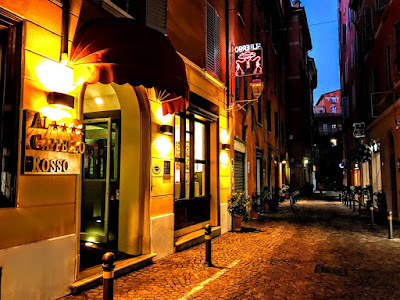 In the proclamations on taverns in the 16th and 17th centuries, Jews passing through Bologna were ordered to stay only at the Capel Rosso, and for no longer than three days. In the 17th century, the Capel Rosso was described as the inn where one could get the best sleep in Bologna. 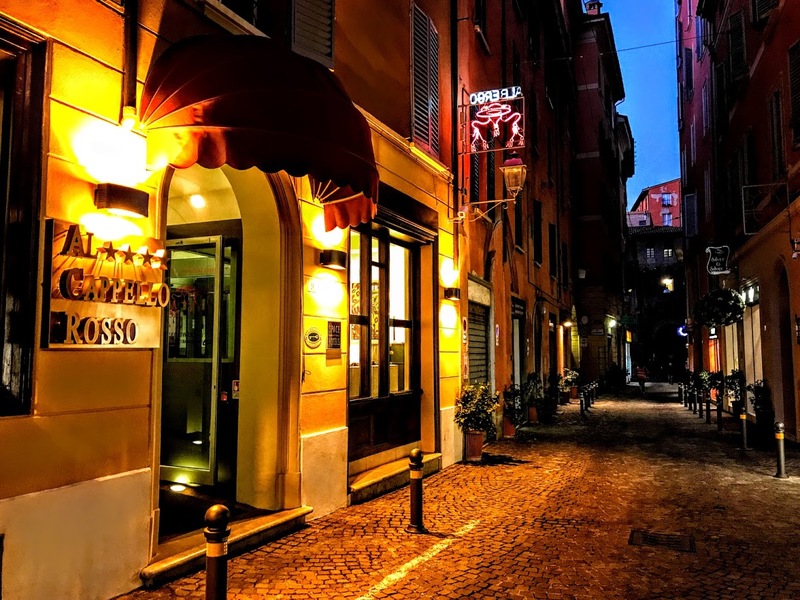 GM Mitelli, an historian from Bologna, mentions the Capel Rosso in 1752, describing it as a tavern that offers its customers ‘delicious roast partridges, well larded and served with toasts.’ The hotel is one of only two taverns and inns named by Mitelli in 1752 that still survive. In the second half of the 19th century, the hotel was run by Alfonso Cappelli, and he and his son completely renovated the place. The hotel was most recently renovated in 2001. It seems to be an ideal place to begin exploring the monuments, markets, shops, mediaeval streets and hidden corners of Bologna on foot.